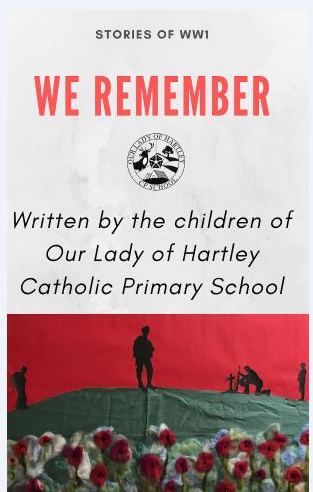 The children of Our Lady of Hartley Catholic Primary School have recently become published authors as part of an inspiring writing project. The creation of a whole school E-Book to commemorate the 100 year anniversary of the end of WW1, involved the participation of every child. ‘We Remember’ features a variety of stories, diary entries, Haiku poetry and greeting cards. As a result of this inspiring project, the children feel a great sense of achievement that their book has the potential to reach a global audience and that they are now published authors! 10% of the proceeds will be donated to the charity ‘War Child’ with the remainder of the proceeds going towards paying for an author visit to the school. If you would like to purchase a copy, the story can be found by following the link here.